Travel the world in books, of course! Expand your horizons and read books set in or written by authors from countries other than the one you live in. Read books authored by those who have won the Nobel Prize for Literature. My wonderful co-hosts of Travel the World in Books were incredibly supportive of this concept -- not only do you get to dip your toes in both challenges, I pretty much guarantee that you'll be amazed at the number of books that qualify for both! Special shout out to my awesome gal pals: Tanya at Mom's Small Victories, Becca at I'm Lost in Books, Savvy Working Gal and Lucy at Fictional 100! Read ONE book this April that qualifies for both challenges. Marquez is the 1982 Nobel Prize for Literature winner. This book is about Latin American immigrants and is set across Europe, including Switzerland Austria. Pick your book and sign up! Read the Nobels blog - over a hundred book reviews by fellow readers. Check out the right sidebar for individual reviews by author or by title. Resources on the Read the Nobels blog - this list-in-progress includes links to a List of Nobel Prize for Literature laureates, laureates arranged by genre, as well as places to download e-books. There's a lot to discover, for example, did you know that any book by Toni Morrison would qualify (she won in 1993), or that classics by Rudyard Kipling or William Faulkner would make great reading for this challenge? My own posts for the Read the Nobels 2016 reading challenge - includes my reviews of Nobel-prize winning books, book spotlights, monthly wrap-up posts for the challenge, and more! Travel the World in Books summary page with links to the link-ups to reviews arranged by region. Check out my Book Map! Ready to get started? Start with your sign up post then make sure to come back for weekly discussion posts so you can link up and also visit other participants. When someone says "Nobel Prize winner for literature," what comes to mind? Is it a positive or negative reaction? Why do you think you have this reaction? Follow example above: What book did you choose? Who is the author / when did they win the Nobel Prize / nationality? Where does this story take place? Why did you pick this particular book? What other authors / books did you also consider for this challenge? Do you have any favourite or memorable Nobel Prize-winning authors or books? Share and be sure to link up so we can check out your reviews! Week 3 (April 18-24): What a Nobel surprise, surprise! Week 4 (April 25-30): Link up your reviews! It's the end of the challenge! Link up your review of your book for this challenge. Tell us a little about where you traveled to in this book. Tell us a little about the author. 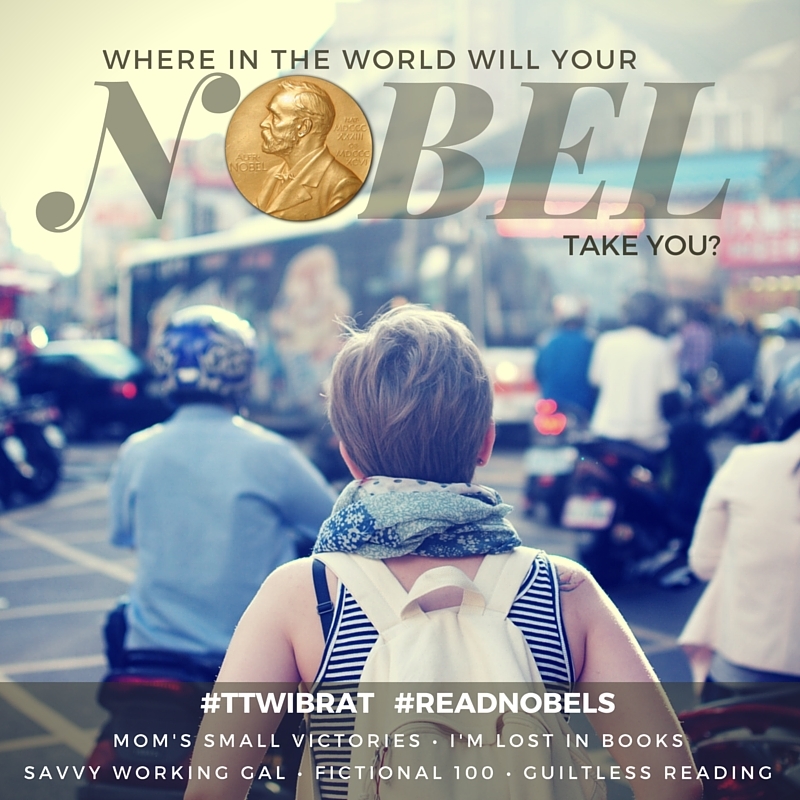 We'd love for you to join us and find out where in the world will your Nobel take you!